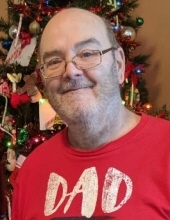 Gary Allen Kendall, age 56, was called to Our One True Home Peacefully on April 2nd, 2019 @ 11:40pm. He made his arrival into this world on February 20th, 1963. He was the youngest of 5 children. As a child, he loved to play pranks. His jokester personality followed him throughout his life! As a young adult, he loved to be in a boat, on the lake, singing in the sunshine and watching his pranks play out at Rough River Lake in Breckinridge County, Ky. He found a Love to Go Fast and with that a Love came a passion for building and racing cars at Ohio Valley Raceway. On July 27th, 1985, he married the love of his life. He raised his 3 children and many of their friends also called him Dad. He Loved with all his heart and truly cared for everyone he met. He became a Papaw in 2002 and was the Very Best Papaw to his 8 Grandchildren plus all the other children in his life that called him Papaw! He went to join His Mother (Marion Juanita Cook Kendall) & His Father (Evans Sanford Kendall Sr.). His Sister (Marion Juanita Kendall) & His Brother (Evans Sanford Kendall Jr.). He will be Always Loved and Forever Remembered by His Loving Wife of 34 years Francine L. Wittenauer Kendall. His 2 Loving Daughters and 2 Loving Son-in-Laws Brandy N. Kendall Payton (Brad W. Payton) & Ashley M. Kendall Darr (Andrew J. Darr). His Loving Son Gary E. Kendall Sr.. His 8 Grandchildren Candice N. Kendall, Gary E. Kendall Jr., Aubrey A. Payton, Silas W. Payton, Gabrielle J. Leslie, William A. Leslie, Travis E. Kendall, & Brianna L. Kendall. His 2 Loving Brother’s and 2 Loving Sisters-in-Law, Terry L. Kendall (Debbie S. Kendall) & Larry W. Kendall Sr. (Marsha A. Kendall). His 3 Loving Nephews, Larry W. Kendall Jr., Brad E. Kendall (Terhia), Michael A. Kendall Sr. (Gabrielle N. Kendall). His 5 Loving Great Nieces and Nephews Emily N. Kendall, Katrina P. Kendall, Larry W. Kendall III, Adrianna N. Kendall & Michael A Kendall Jr.
We will be having a Celebration of Life Ceremony Sunday from 2pm – 5pm at South Jefferson Christian Church, 6500 W Orell Rd. Louisville, Ky 40272. For Any Donations, Flowers, Cards and Condolences can be brought with you to The Celebration of Life Ceremony if you can make it. If not, they can be sent to Brandy Payton’s Home at 9416 Dalton Dr. Louisville Ky 40272. To send flowers or a remembrance gift to the family of Gary Allen Kendall, please visit our Tribute Store. "Email Address" would like to share the life celebration of Gary Allen Kendall. Click on the "link" to go to share a favorite memory or leave a condolence message for the family.